Life in the United States is good. Despite the persistent pessimistic view of the news, and dreary talk of the economy, at the end of the day just about all Americans can come home to a toilet that flushes. Having a flush toilet is such a commonplace thing that we as Americans don't even demand it, we expect it. Unfortunately, in many places of the world, the flush toilet isn't so commonplace; it is in fact a luxury. Being in the healthcare field, one has to wonder that in a place where a flush toilet is a luxury, what kind of health care do the people have access to? In 2011 the average salary of the Filipino is around $5,800 a year. Factoring in that usually only the men work, and that most Filipino families are quite large, that $5,800 dollars hardly seems enough at all. And since the Filipino health care system is strictly pay-per-service, most of the indigent population doesn't have access to healthcare at all. I kept this information in mind during my 27 hours of travel from south Florida to Buena Vista, a rural village in the Bicol region of the Philippines. I wondered what kinds of people I would meet and what I could possibly do to help them. A few jet-lagged days later, clad in my scrub pants and T- shirt, I approached the clinic which was just a few hundred meters away from the dormitories. Outside of it there was a huge throng of Filipinos both old and young, all waiting to be treated. And then it began. Through the translator I would attempt to figure out what problems the patient had. And then which of those problems I could treat, with my ability to treat directly related to the size of the pharmacy (drugs we brought from home). And with each passing day, that pharmacy shrank and shrank. Although limited by our supplies, it felt good to be able to put my education to work by helping someone in need. It felt good to give antibiotics to the mother of a child and tell her that her child will get better. I was happy to help, and the Filipinos were happy to have my help. Not all the patients I saw had problems that could be fixed medically. Some simply came in with a cyst that they wanted removed. Now not only was I practicing medicine, but surgery as well. In many cases I was the first surgeon who actually removed the cyst and then stitched the patient back together. After some time spent shadowing a hand surgeon, I now found myself taking care not to damage the flexor tendon of the patient's finger as I carefully removed her ganglion cyst. The whole experience was exhilarating, and incredibly satisfying. I can remember one day when I was closing a wound in a woman's leg after she had a cyst removed, and I started to hear strange grunts from afar. The power was out in the clinic that day so the windows were open to compensate for the lack of light. As I glance upwards out of the window I see a young boy with a cleft palate making strange faces at me. Here I am in the middle of surgery, with no power, no air conditioning, staring at a young boy making silly faces. So of course I made silly faces right back at him. Throughout the countless cases of peptic ulcer disease, high blood pressure, and cyst removals, one patient in particular sticks out in my mind. She was a 10 year old girl who had tetralogy of fallot. I felt her right parasternal heave, I heard her harsh systolic murmur, I saw the clubbing of her fingers and toes. My senses became aware of this little girl's unfortunate textbook presentation. If this were the United States, this patient would have been fixed at birth, but here in the Philippines, she was born with, and may very well die with her congenital heart problem. What was the solution? What could we do? The Filipino surgeons could operate on her, for a cost of $10,000. To that family, $10,000 might as well be a million dollars. There is no way that they could ever afford that surgery, so they turned towards the Bicol foundation to finance it. The truth is, I don't know if that little girl will ever get that operation. I believe that everyone has a right to medical care, and it is a shame that many people of the world don't have any access whatsoever. Even though many Americans don't have health insurance, in an emergency they would still receive treatment. In many places of the world, this isn't the case. Some people have literally no access to health care and are forced to suffer on their own. 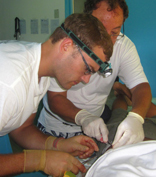 Practicing medicine in the Philippines was an incredible experience for me. Not only did I further my education, but I got to see the unfortunate lack of healthcare that exists in some parts of the world. Third world medicine is definitely something that I want to continue to do throughout my career, as helping those in need is what drove me into medicine in the first place. Because of my experiences I believe that I will not only be a better doctor, but a better person.